August 8, 2017, 2:07 PM · No more waiting in long food lines at Walt Disney World? 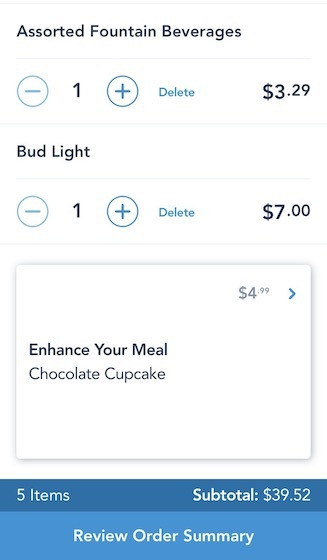 Now, thanks to Disney’s new mobile food and beverage ordering system, you can have food ready when you arrive at the restaurant. I have tried this out myself twice and found it to be best way to order food quickly while spending a day at the park. 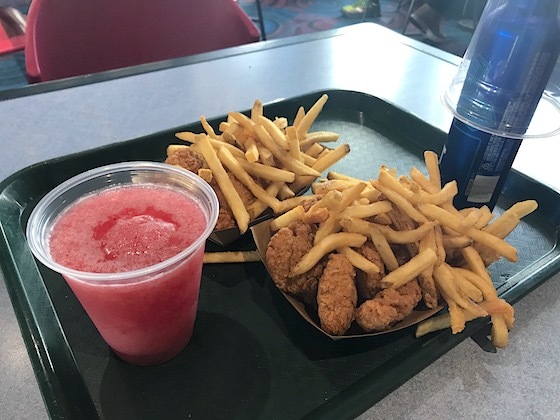 I will show you with this step-by-step guide why it should be your go-to method when ordering quick-serve meals at the Walt Disney World Resort. 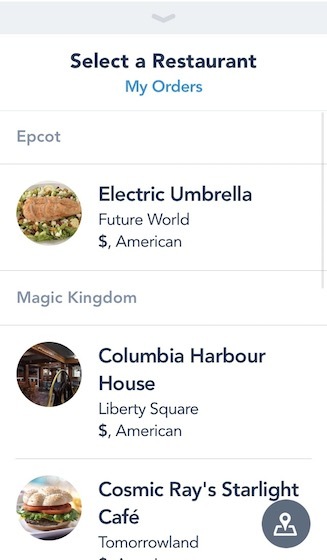 Using the system requires the official My Disney Experience app, which is available for iOS and Android. 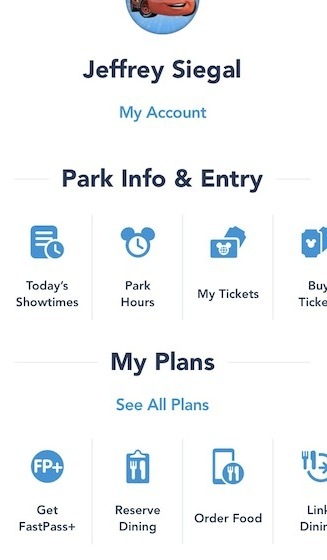 It's a must-have for Fastpass+, wait times, and navigating the park, so if you don't already have the app, download it, create an account and sign in. Then, when you are in the park and ready to eat, go to your account page and tap the "Order Food" option near the bottom of the screen. and you will see the time in which you can pick up your order. Now, you'll need to "Build Your Order." Tap each item you want on the screen above, then confirm to add it. 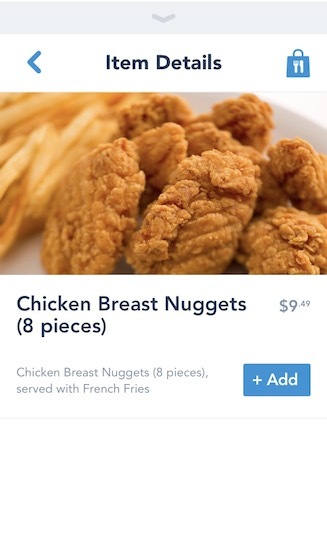 When you are finished selecting your food and beverages, tap on "View My Order"
Select "Review Order Summary," and if your order is not what you wanted, press the back arrow. Scroll all the way down for the purchase sign to be activated. The app will ask you to enter a credit card if you don’t have one stored already. Select Purchase and then head on over to the restaurant. When you are almost there, open the app, go to your account page, tap "Order Food" again, then you will see a "My Orders" link. Select your order, then tap "I’m Here, Prepare My Order." 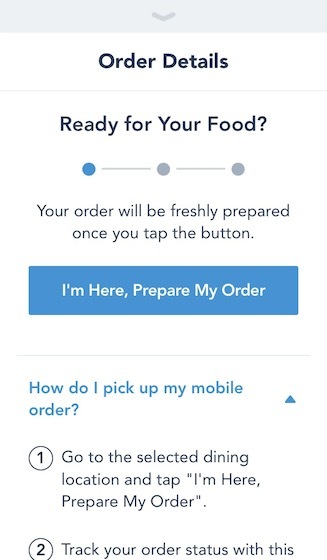 You will receive a notification when your order is ready so head on over to Mobile Order Pickup window to get your food. Using the My Disney Experience app to order food was fantastic. The biggest plusses are that it saved me a good amount of time and I never had an issue with my order. I estimated I saved eight to 10 minutes of waiting in line when it came to ordering and picking up my food. It could have been longer, since I ordered at the start of the lunch hour rush. My food came out hot and my drinks were nice and cold. Another great thing about the system is that I only waited two minutes for the restaurant to prepare my order. 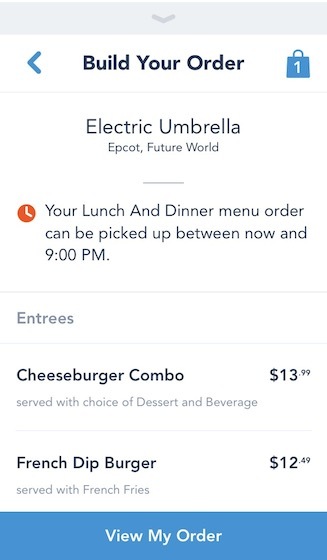 Granted, this ordering system is new and the Electric Umbrella became available last week, but I believe that this option always will be faster than waiting in line. As far as my gripes about the system, it's hard to criticize that there were seemingly too many steps when using this app because each step helped ensure that I was accurately ordering everything that I wanted. Changing what I wanted or removing items was simple. My only real criticism is that there needs to be more restaurants. 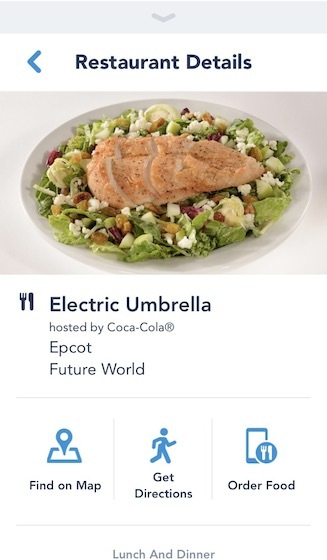 However, that will be addressed as Disney rolls out mobile ordering at more restaurants. Also note that Disney is planning to make additional payment options available in the future, including using the Disney Dining Plan. Overall, I would use this system again in a heartbeat. In fact, I would go out of my way to order quick-serve only from restaurants with mobile ordering available. I conveniently can order what I wanted when I wanted. Who wants to wait in more lines? Add more time to riding rides and exploring the parks by ordering from the app. August 8, 2017 at 3:21 PM · Awesome sauce! I will be using this system on my trip later this month. Thank you for the step by step instructions and pix! August 8, 2017 at 5:31 PM · Thanks for walking us through. I tried this on my last trip (Sauui Canteen) and it worked pretty well. However, I found it had a bit of a learning curve which you discussed! Glad to see it at Columbia Harbor House! August 8, 2017 at 6:14 PM · Can't wait to use it in a couple of weeks! Thanks for sharing with pictures! August 9, 2017 at 8:01 AM · I wonder, as this expands to more restaurants, if Disney will allow for more order customization. As it stands right now, the restaurants' items don't have much flexibility in terms of customization, but if this expands to other eateries, I would expect that functionality to need to be added. It does seem like the app has a few too many steps, and I wonder that as it gains more popularity if the reduction in lines at cashiers swings the advantage back to those ordering in person. I also think Disney should add an option for those wanting to pay cash or not have their credit card information stored in the app. 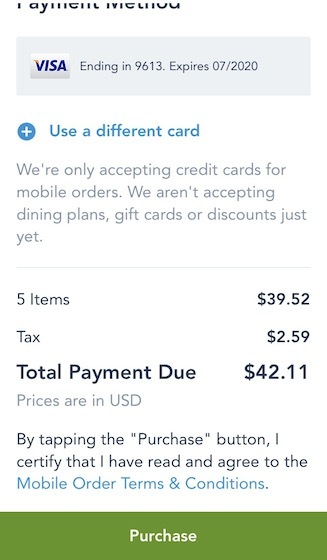 A "pay at location" option should be offered to allow customers to create an order that is held until the customer pays at a designated cashier at which point the order is sent to the expediter in the kitchen. There are a lot of people that would want to use this, but not willing to pay with a credit card or have their credit card information stored on the application. This appears to be a solid first step, but Disney still has a ways to go to make this a viable alternative for most guests. @Jeff - Do you know if you can get a refund if you decide you don't want the meal you've ordered? 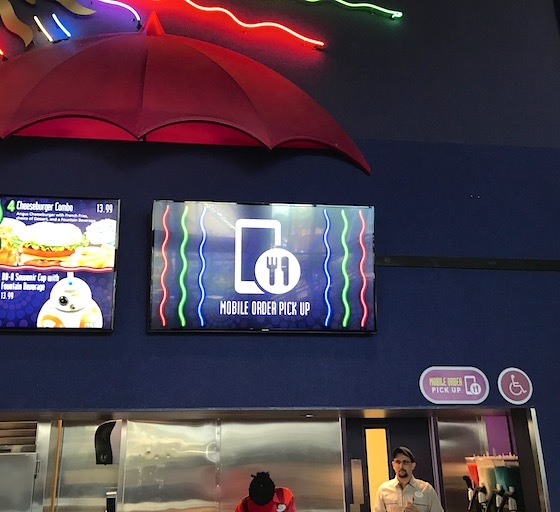 Hypothetically, you could place your lunch order at 10 AM while you're waiting in line for an attraction, but something happens between then and when you plan on eating that prevents you from getting to the restaurant to eat. Is there functionality in the app to cancel an order and get a refund, or do you have to talk to a Cast Member (and can they even do anything once you've already paid)? August 9, 2017 at 10:55 AM · Thank you for the information! I can't wait to test it out! But I did try this at Salu Canteen and was impressed. August 9, 2017 at 4:43 PM · Great article, Jeff. August 9, 2017 at 5:25 PM · Thanks James, Anthony, toodaloo and others! I'm glad you all found the article helpful. @Anthony and Jaiden - Satu'li Canteen is a place I very much want to visit and now definitely look forward to trying it out next. Thanks for the info. @Russell - That's a very good question and was wondering this myself. I have contacted Disney and am awaiting their response. I will get back to you as soon as I get their answer. August 10, 2017 at 7:59 AM · Mobile ordering will have one major benefit... If I omitted an item, it's easier to order more food from my smartphone. The hassle of lining up and re-ordering more food prevents me from spending more money especially when any person in my group forgets something they dearly want later. Amazon seems to get their online ordering right. I hope Disney gets it right, but it'll take a longer amount of time. I heard they initially omitted gift cards and Disney Dining. Will they finally add those two payment plans? Will the app include AP discounts automatically? Customizing orders should be smoother if they make their mobile apps more capable. I would like to choose my own preferred sides than automatically getting fries with each order. 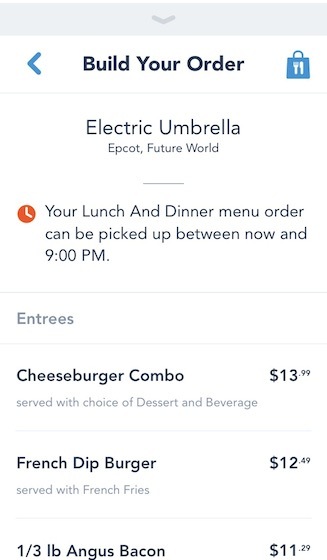 August 10, 2017 at 3:13 PM · @ Russell - Here's Disney's response: "If you use the mobile application to preorder your food and never hit the "I'm here" button for pick-up then you will not be charged. Once you select "I'm here" your credit card will be charged if you pick up the purchase or not." As far as asking for a refund after tapping I'm here, I assume one would have to call Disney. Anton M - I used the app for a similar reason, I needed more drinks. When I was sitting down, I ordered more drinks and had it within my grasp in a minute. I was pretty happy as I saw the lines starting to get really long. August 11, 2017 at 6:10 AM · Seems sensible Jeff. I'd be curious to know if you're indeed not charged until you hit the "I'm here" button if you'd be able and go in and make changes to an order before arriving at the restaurant and declaring "I'm here". It would be unfortunate if you would have to start the ordering process all over again if you wanted to remove or make a change to a single item in a large order. 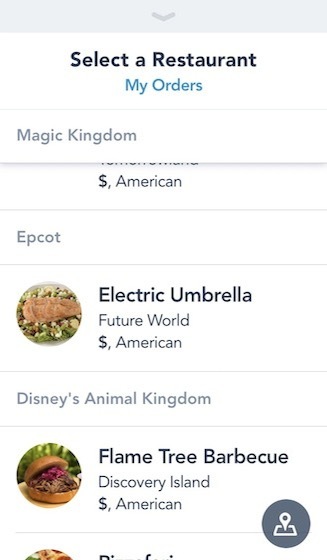 Disney is banking on guests using this application to avoid the lines, but I wonder if at some point they make it even more advantageous for mobile order customers by offering discounts and/or freebies for making frequent mobile orders. Other restaurant chains offering mobile ordering apps not only give guests the advantage of skipping lines, but also build in loyalty rewards by giving guests discounts and free items from time to time (while tracking their preferences and locations). Clearly the line avoidance for guests at Disney is a HUGE draw, but at some point I would think Disney might want to sweeten the pot to get the last group of techno-phobes on board with the system. August 11, 2017 at 12:29 PM · It's like Disneyland's MaxPass but for food! I wish I had had this available at Disneyland this week! Did Disney just blow up the entertainment business?